Captain James Ferrara and his PHantoms teammates with the play-off trophy. Photo: �2018 Tom Scott. All rights reserved. Another wonderful chapter has been written in the Peterborough Phantoms sporting fairytale. 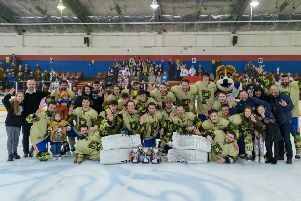 The double-winners became treble heroes last night (April 7) when adding the NIHL Division One South play-offs crown to their collection of honours. Phantoms man-of-the-match Martins Susters celebrates scoring one of his four goals against Bracknell. �2018 Tom Scott. All rights reserved. A 6-4 triumph in the Bretton second leg followed up a 7-4 success in Berkshire the previous evening and added up to a dominant 13-8 verdict on aggregate against Bracknell Bees. It was ultimate triumph of brain over brawn with the ugly, physical Bees put to the sword by the slick, quick quality of Phantoms as Slava Koulikov’s stellar group of players completed a second honours hat-trick in the club’s history. The latest treble arrived a decade after the club dominated at English Premier League level and occupying centre-stage among the class of 2018/19 last night was Martins Susters following a magical individual performance which featured four goals and two assists. The early-season capture of the Latvian-born talent was one of many marvellous pieces of recruitment from Koulikov who has now overseen four trophy successes during his Phantoms reign - and few would bet against there being plenty more. Phantoms netminder Jordan Marr makes a save from Bees' Tyler VanKleef. �2018 Tom Scott. All rights reserved. 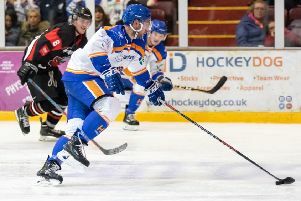 A double-strike from Susters ensured the opening period went perfectly to plan for Phantoms last night as they extended their three-goal aggregate cushion. He classily clipped in an early opener when displaying the sort of wizardly more commonly associated with a pitching wedge than a hockey stick. If his opener was all about clever execution, Susters’ second goal was a product of sheer power as he sent an unstoppable one-timer flying past Skinns on a powerplay. In between those goals the star Phantoms performer was netminder Jordan Marr who pulled off a series of fine saves as Bracknell applied plenty of pressure without success. The two teams shared four powerplay goals in the second period with Ed Knaggs and Josh Smith twice hitting back for Bracknell only for Corey McEwen and player-coach Tom Norton to provide quick responses for Phantoms - the latter doing the honours in a five-on-three situation. There were plenty more examples of excellence from Marr in that middle session as Bracknell refused to give up on a comeback bid despite being let down by their lack of discipline. And that latter point became even more salient in the final period after Smith struck again as the Bees cashed in another numerical advantage. But they then had Ben Paynter thrown out for a check to the head - an offence almost immediately punished as Susters completed his hat-trick with another terrific finish. And the young Phantoms talent wasn’t done there when tucking away a fourth goal late on before collecting a penalty for incitement after some exuberant celebrations towards a Bracknell man. That powerplay led to the final goal as Tyler VanKleef pounced for Bracknell before they had Josh Martin thrown out late on for attempting to pick a fight with Phantoms defenceman Nathan Long. And there were more ugly scenes in the final seconds as a host of Bracknell players jumped Nathan Pollard who had scored after not hearing the whistle for an offside call. But order was soon restored and Phantoms were able to celebrate another famous success in a season which will never be forgotten. And it’s not done yet . . . all roads now lead to Coventry for the NIHL Final Four this weekend.